This curriculum for high school students is designed to provide students with a thorough understanding of all important physical, mental and social health issues. 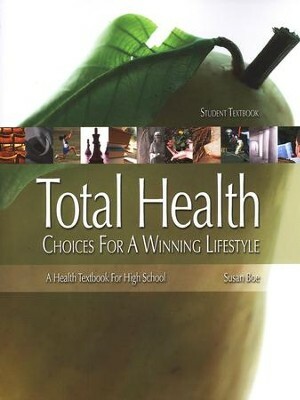 Written directly to teens from a caring and friendly perspective, Total Health presents a moral basis for a healthy lifestyle based upon scriptural principles. Anatomy, Body systems, food choices, exercise, diseases, stress, emergencies, responsibility, and more. Illustrations and photographs add visual interest to the text; at the end of each chapter, a review contains terms to define, questionsbased on the text, biblical application questions and suggested activities. 464 pages, indexed. Softcover. Q: Is this a semester or year course? This course fulfills one credit of Health. It may be taught in one semester as five 50-minute lessons per week; one year as three 40 to 50-minute lessons per week or; two years as two 30 to 40-minute lessons per week. Q: What credits does this fulfill? Can it fulfill one credit of high school science? This curriculum provides for one year of High School Health, which is considered an elective credit. I'm the author/artist and I want to review Total Health High Student Softcover.